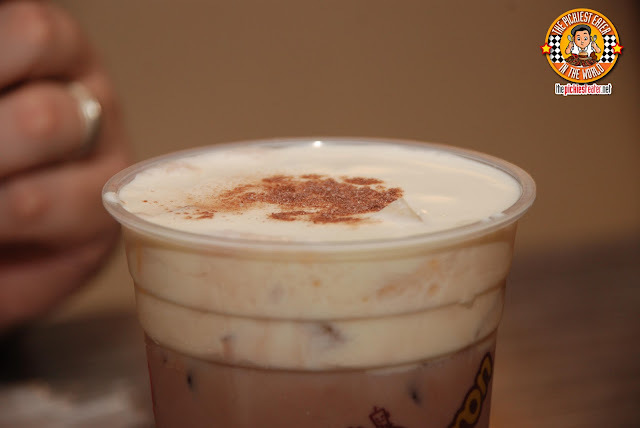 What can you say about the whole Milk Tea craze? No disrespect to those who have been totally captivated by it, but I personally find the stuff disgusting. 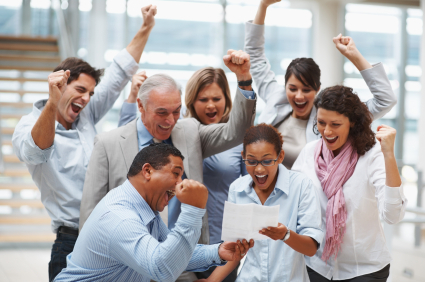 If you say the words "Gong Cha" or "Serenitea" in my office, everyone loses their frickin' minds, and BAM, it's a given.. They have to order delivery. It's not like I didn't give it a chance either. During a monthly meeting, everyone was asked where we wanted to order merienda, everyone inexplicably answered "Gong Cha". I was baffled because I was thinking to myself.. "But.. That's not.. Merienda...". The fact that we wouldn't be eating any form of solid food (except for the pearls in the bottom of the drink, of course) wasn't an issue. I was suggesting San Lo's Famous Emapanadas but they wouldn't hear it. They wanted their Milk Tea, and nothing else in the world mattered. My grumbling tummy, however begged to differ. Nonetheless, I decided to not let my pickyness spoil their Milk Tea Party so I played along and asked for a chocolate one, hoping the overpowering taste of the chocolate would blend beautifully with the tea. It became highly evident that, unless it's "C2 Apple" or "Nestea", I'm not a tea person. So when I heard about "Happy Lemon", I brushed it off as just one of those Milk Tea places. A few months ago, I was reading up about it, and I heard about their famous drink, "Cocoa with Rock Salt & Cheese", and was immediately intrigued, and a little bit weirded out. 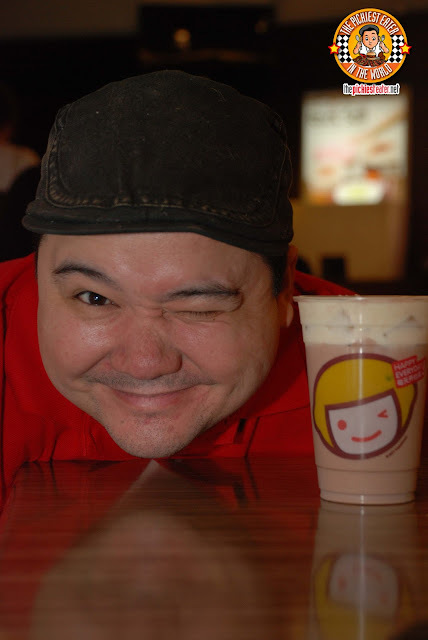 In my mind, I imagined a glass of the chocolate milk tea I had tried during our meeting, topped off with grated quick melt cheese and a sprinkling of salt. Weird, right? I asked my friend, the lovely Donna, if she tried had tried it already, and she said she had, and she loved it. 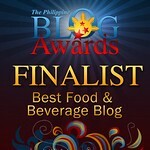 I then asked my officemate, and Serenitea addict, Chi, if she had tried it. She said "Yes, but I like Serenitea more". So I asked her why, and she replied, "Because Happy Lemon's Cocoa with Rock Salt and Cheese isn't tea. It's chocolate!" 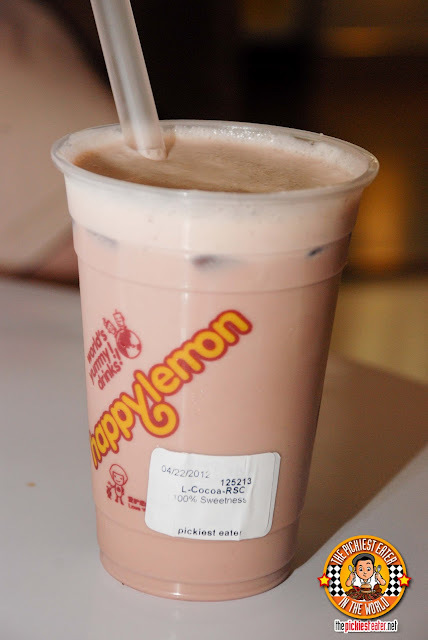 It seemed my disgust with milk tea clouded my thinking so much, I hadn't realized that Happy Lemon's Cocoa with Rock Salt and Cheese does not have the word "tea" in it at all. So one fine day, when Rina and I were at Rockwell, we came across a Happy Lemon, sat ourselves down and decided to give the popular drink a try. 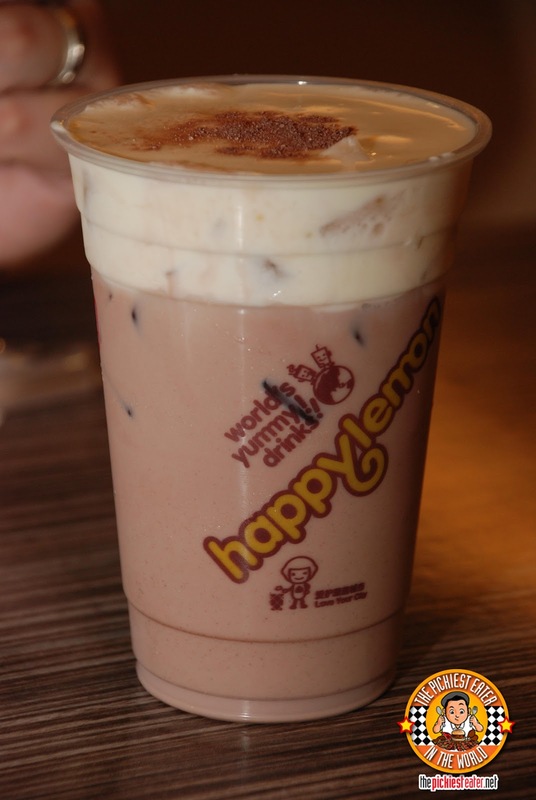 And so began our addiction to Happy Lemon's Cocoa with Rock Salt and Cheese. The reason why this is a quick pick instead of a full on post is because I wanted to profess my love for this one specific drink. Like a lovesick cow that is convinced he has found his soulmate, I don't want to even LOOK at the menu of Happy Lemon anymore. I don't know how anything in their roster of drinks can compare to the awesomeness of the Cocoa with Rock Salt and Cheese. I'll be honest with you.. It wasn't love at first sight. Since my straw pierced straight through the white froth that comprises the top layer of the drink, and went straight to the chocolate liquid, i wasn't impressed on my first sip. In fact, I actually found it a bit bland. I looked at Rina and said, "I don't get what all the fuss is about.". It came off to me as something like a watered down chocolate milk. I then took the straw, and dabbed the white foam, and gave that a taste. I realized there was a certain sharpness to it that was meant to be mixed with the mildness of the chocolate. I gave the glass a stir with the straw until it blended with the chocolate. My initial thoughts were that the white cream was the cheese, and the chocolate sprinkles was the "Rock Salt". Apparently, the cheese is already mixed in with the Rock Salt. And just like that, I was a goner. As I suspected, the white foam blending with the chocolate turned this into a phenomenally refreshing drink. I have no use for pearls and all that crap. I love the Cocoa with Rock Salt and Cheese just the way it is (If that's not true love, then I don't know what is). The light creaminess of the chocolate is tempered by the saltiness of the cheese, creating a wonderful balance between the two. Every time my mouth takes to the straw, I run the risk of finishing the whole glass in just one sip. I've been back to Happy Lemon around five times... in the span of a month. Rina and I usually share one Large Cocoa with Rock Salt and Cheese (P100), but after the most recent incident wherein I checked my phone for a few mins and when I looked at the glass, all that was left was ice, its about time we start getting one each. When going dining out, my focus has always been on the food. With my new found addiction to Happy Lemon, this could be the start of a drinking problem for Rina and I (We fight over the drink). You should try adding an extra layer of rock salt and cheese to your drink. It will be heaven! Thanks Jojit! will try it.. I didn't know you can do that haha! Havent tried cocoa with rock salt and cheese, but i tried the lemon pineapple with nata :) its good but i still prefer gong cha's wintemelon milk tea or chatime's taro red bean or taiwan mango qq. My tummy hurts if i drink milk so i try to pick the fruit teas instead. in another life, quite possibly, Michy! Haha! You'd better try Share Tea's version, its much much denser and way cheaper. I'll keep an eye out for it, Berylle! Thanks! damn i wish I had a cadet!! haha! I learned a lot from your comment! I've tried the Chocolate Mousse of Chatime, and I liked it mainly because It doesn't taste like tea.. But I enjoyed Happy Lemon's rock salt with cheese morethough..
yeah i love 9gag too! haha!! haha thats good to know.. kala ko nakalimutan mo na ako hehe! ingat!! Just wanna share my happy lemom exp. Sayang your post came out during my second to the last day of vacation in Manila. I wish I had known about this place so I could've tried the drink you ordered. Yeah I was so surprised to learn about the milk tea craze there. I only had one at UCC, I think I had just regular tea with milk and the bubbles (sago). Dito sa US I can only find a similar drink when I go to a Vietnamese or Thai store, and they're not that easy to find. Yup based on your reviews we went to Chelsea, Zong, and Pig Out. Hubby and I took my family to PF Changs (although I've eaten at PF Changs here back home but wanted my whole family to try it). Somewhere I saw someone complain about the poor airconditioning at Chelsea, and they haven't resolved this. Ang init when we went there, and evening pa so I thought it won't be too bad, pero we were fanning ourselves almost the entire time but yes the service was great because they moved us to a better ventilated area. Pig Out...I didn't like it that much. For a place called Pig Out you would think the servings would be big so that you could "pig out" but the servings were miniscule. They should just increase the price a bit to compensate for the serving size if they want to keep up with their name. You make an excellent point regarding Pig Out.. especially if you're used to American servings!